Ladies and gentlemen, our culture has created a new kind of “mental illness” to suffer through. A recent article in The Wall Street Journal highlights the modern form of road rage with a twist – sidewalk rage. It’s being comically called “Pedestrian Aggressive Syndrome,” and likely is in a city near you. In Lower Manhattan, the capital of “side walk rage,” people average 4.27 feet per second. If you cannot keep up with this unwritten rule of how fast to move your legs you’re at risk for the rage and hostility of the fast walkers around you. Quite literally, we are becoming a people addicted to anger and speed. You probably didn’t need a mental health professional to tell you that. You’ve probably felt it in your own life. 3) Ipod addicts walk 4.64 feet per second. 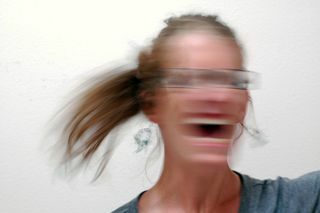 The aggressive episodes are not better accounted for by another mental disorder (e.g., Antisocial Personality Disorder, Borderline Personality Disorder, a Psychotic Disorder, a Manic Episode, or Attention-Deficit/Hyperactivity Disorder) and are not due to the direct physiological effects of a substance (e.g., a drug of abuse, a medication) or a general medical condition (e.g., head trauma, Alzheimer’s disease). We have a diagnosis … do we have a treatment? Research published in the journal Research on Social Work Practice looks at treatments for conduct problems including aggression, violence and anti-social behaviors that occur in one’s natural living environment. The research is a meta-analytic review of nearly 2,000 other studies dating back to as early as 1980. The research categorized the psychological treatment for aggression, violence and other disorderly behaviors in four clusters including: cognitive-behavioral psychology, family systems and humanistic psychology, multimodal, and psychopharmacological interventions. Of these, family systems theory and humanistic psychology produced the most widely recognized and positive effects in those being treated for conduct disorders and aggression issues. “Only humanistic therapy orientations were found to have an increased effect on conduct disorder behaviors” states authors Litschge,Vaughn, and McCrea. What this suggests is that the best way to keep the modern world from making you addicted to its speed and anger is to slow down, be in the moment, and explore your own interiority – the hallmarks of humanistic psychology. This enlightening research comes in the wake of public outcry regarding the deadly side effects of antipsychotic medications used in recent years for their “off-label uses” for DSM diagnoses including conduct disorders, motor skill disorders and other “mental illnesses.” One such case was won yesterday in the state of South Carolina against the company, Janssen Pharmaceutical. Through the illegal marketing and promotion of off-label uses of the antipsychotic Risperdal, the pharmaceutical company misled Americans and their doctors about severe side-effects; including diabetes, cardiovascular issues and other metabolic conditions. Similar lawsuits are occurring around the country involving the psychotropic medications, Zyprexa and Seroquel. For a society who is increasingly addicted to speed, aggression and other maladaptive conduct issues–the answer is clearly; humanistic psychotherapy. Avoid the noxious and risky side effects of psychotropic medications — and avoid thinking of yourself as one more cog in a fast paced machine. The answer to the diagnoses of our time is to fully embrace your humanity, one quiet moment at a time.